Crowdcube & Emoov – Crime, grime or sublime? Both crowdfunding and kickstarting have been a real positive for many start up businesses globally, highlighting yet to be signed up talent and enabling investors to join in on many successful roller coaster rides as well as helping start-ups to grow from ideas to national / international companies. There has been a few #PropTech success stories thanks to crowdfunding. With any investments there are of course risks and not every company that received funding have gone on to that fairy tale result, many have crashed and burned thus taking with them dreams and money! Clearly explained and legally water tight, the investor knows the risks and today will usually have to answer a questionnaire before submitting any money via crowdfunding that ultimately tells them that ‘hey, you are most likely going to lose your money so what the heck are you doing’! I have raised money via crowdfunding, have invested and lost, built companies and sold them thanks to external investments as well as admitting defeat and closing businesses that had disappointed investors. Bumps and bruises along the way, I kinda get the whole idea, how it works and of course, as explained, know what the risks are – I have also seen the holes in Crowdcube first hand when submitting a pitch, though many hoops to jump through with them to get a live pitch on their platform, there were clear errors and things missed. So what have Crowdcube, to many the most famous of crowdfunding platforms (though it has lost money every year since launch), and Emoov, who are one of the headline hitting stories in this sector, done to deserve such a title ‘Crime, Grime or Sublime‘? A recent article by This Is Money website headlines with ‘How online estate agent Emoov didn’t reveal its £15million loss to investors following audacious three-way merger… ‘. The same report by the same author was also on the Mail Online website. Important to the whole story is that since the report came out, Russell Quirk (founder of Properganda PR) who is former Cheif Exec of Emoov, has rubbished the reports and the figures / times quoted. He should know what is what surely and he is very much, so many will say, quite open and clear with what happened at Emoov. The This is Money article reports that Emoov were losing £3 million a month though documents given to investors did not reveal any loses? Was this hidden by Emoov or was it simply not requested by Crowdcube? What the eye doesn’t see the chef gets away with maybe? Just how much risk should be put on investors and what security can they expect when making investments, is this case in deed fraud (it is said that some investors are still in process of legal action against Emoov). I would very much doubt that such big figures would be hidden. How big a damage will this do for online estate agency going forwards (TheHouseShop who crowdfunded soon after ended their pitch early following only raising approx a subdued 50%) and what about Crowdcube themselves? Should you trust your money with what seems to be a crowdfunding platform who supposedly do not require firms to give over a fully transparent view of their finances and recent performances? 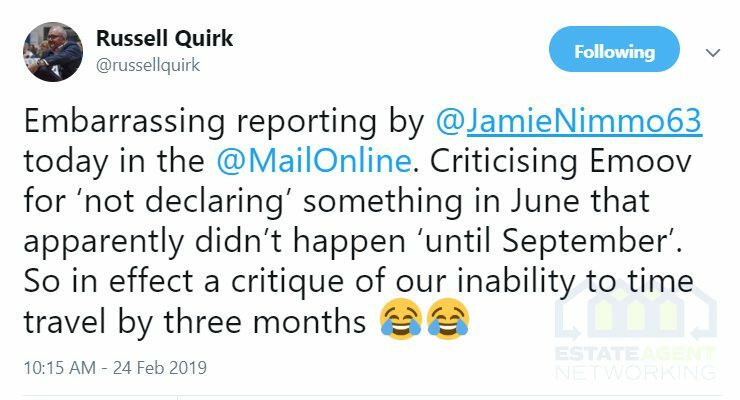 This all comes about because Emoov failed, if it had been successful then of course it is unlikely any of these failings would have hit any worthy headlines, but now that things have gone sour, the memory of this story will live on for some time to come.